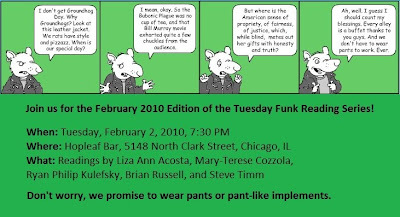 Please join us on Tuesday, February 2nd for the second Tuesday Funk Reading of 2010. Liza Ann Acosta teaches Comparative Literature at North Park University and is an artistic associate of Chicago's only all-Latina theater company, Teatro Luna. Mary-Terese Cozzola is a writer and filmmaker. Her prose and poetry have been published in Crawdad, After Hours, and Swivel, and her films have screened at the Gene Siskel Film Center, the Chicago Short Comedy Video &amp; Film Festival, and the Midwest Independent Film Festival. She has performed solo pieces at the Stockyards Theatre Women's Performance Art Festival and SpeakEasy/SpeakHard: the Malinowski salon. You can learn more about her work at www.mtcozzola.com. She lives in and loves Chicago. Ryan Philip Kulefsky lives in Chicago, IL and holds an MFA from Bard College. His chapbook, DEAD TWINS, published by Bathroom Reading Materials (2010), is comprised of contributions to an email listserv during the fall of 2009. He teaches writing and rhetoric and American literature at Columbia College. Brian Russell earned his MFA from the University of Houston, where he served as poetry editor of Gulf Coast. His poems have appeared or will in Mid-American Review; Epoch; Quarterly West; LIT; and Forklift, Ohio; among others. He has been nominated for a Pushcart Prize in the past three years. Steve Timm is a poet and author of 'n'altra storio, Disparity, and the chapbooks Stragetics and Averrage. He was the performer in A Poem by Steve Timm, a video by Ya-Ling Tsai chosen for the 2004 Wisconsin Film Festival. He teaches English as a second language at the University of Wisconsin-Madison. This page is an archive of recent entries in the Reading # 21 category. Reading # 20 is the previous category. Reading # 22 is the next category.